← Killer Nashville is Coming! Readers, meet my friend Robert, pictured above with his daughter, Kimberly. He kindly consented to write his impressions of the wonderful Iroquois Steeplechase, held on May 14th. As a Jump Marshal, his is a unique view. Thanks, Robert! Saturday, May 14th, was the 70th running of the Iroquois Steeplechase at Nashville’s Percy Warner Park. 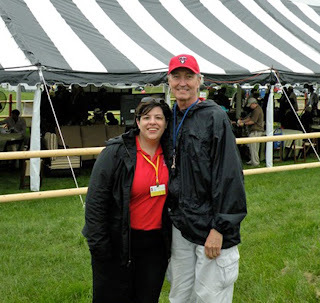 My thirty-something daughter Kimberly and I were Jump Marshals, along with hundreds of other volunteers at the Iroquois, and Marilyn asked me if I would write a guest blog about my experience this year. I was happy to be asked and anxious to write this! I have been to the Iroquois five times. Once as a spectator in General Admission on the hillside. Once with press credentials which allowed me to be all over the grounds observing everything. And three times as a volunteer Jump Marshal which keeps me near one jump for all the races, but very close to the horses, with nothing between them and me. I can feel them thunder by! I guess there is a bit of danger that adds to the thrill. This year, I invited my daughter from Knoxville to be a Jump Marshal along with me. Kim and I spent hundreds of hours together at horse shows in her teenage years. In fact she is the person who steered our family into “horse fever” or “horsin’ around” in the early nineties. I was hoping we could recapture that feeling of being together at a horse show–and I have to say it worked. We plan to do it every year from now on. The Iroquois is difficult to write about, because there is too much to write about. It’s a horse race, it’s a party, it’s a fashion show, and it’s Nashville on display. It’s Nashville’s Kentucky Derby (and always the Saturday after the Derby.) One of its prominent signatures is the many beautiful and crazy hats, which I believe was increased this year due to the influence of the Royal wedding. Here is a great link: http://www.facebook.com/media/set/?set=a.211368625563831.60203.204660386234655. And for a lot of interesting history regarding the Iroquois since 1941, go here: http://www.iroquoissteeplechase.org/RaceInformation/AboutIroquoisSteeplechase. What part do Jump Marshals play at the race? Marshals are part of the emergency response team who tend to the safety of each of the nine jumps. We are also the eyes and ears of the Emergency Response Director, in case anything happens. In the three years, I’ve been a Jump Marshal, there have been no problems on my assigned jump or at any of the jumps, although every year there has been a riderless horse, which means the jockey fell off his mount. I suggested to Kim because she was a new volunteer at the jump that she pretend that Classy (her beloved horse) is running in the next race, and do everything you can to ensure her safety. That means all divots filled, all debris picked up, no spectators on the track, and protection and response for any human or horse that possibly go down. The emergency response team at the Iroquois is second to none, with marshals, EMTs, physicians, veterinarians, ambulances, horse ambulances, and life flight helicopters at the ready on site. I like the Iroquois races because I like horses and all things horse, and this event keeps the interest in horses alive in the minds of Middle Tennesseans. (I have a gnawing fear that the horse is slowly fading away in modern society.) The race also keeps Middle Tennessee economically alive. The last race alone had a $150,000 first prize with $450,000 in total prize money. Of my five Iroquois experiences, the rain has been a factor (including the Nashville flood of 2010) in all but the first. There is something about the second Saturday in May that brings out the quirky weather. We should be due a nice sunny day next year. I’ll see you there! This entry was posted in Iroquois Steeplechase by MMFisher. Bookmark the permalink.